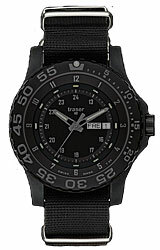 Traser's newest Officers Field Watch features a gunmetal steel case, black dial and grey numerals. The crystal is sapphire glass and the watch is shock and water resistant (to 330 feet below sea level). 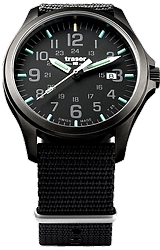 The dial is fully illuminated in the bright, easy-to-read green and orange tritium. 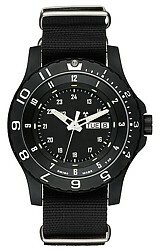 This slim watch is ideal for Emergency Medical Technicians (EMTs). doctors and nurses and anyone needing to check the pulse or other vital signs in low light or dark situations.